Beautiful Rendition of Fulton's Highly Sought After Peninsula Executive Series Great Room Plan! This Home sports the Bedroom Suites layout where each bedroom is oversized with a Walk-in Closet, & the two secondaries share a Luxurious Jack N Jill Bathroom. Both Den & Formal Dining Rooms have Gorgeous Wood Flooring & French-paned Doors. The Wonderful Great Room Opens to Fabulous Kitchen w/Exclusive Cherry Cabinetry, High-end Appliances, including 5 Burner Gas Stove w/Commercial Style Vent Hood, Oversized Island & Walk-in Pantry. VIP Master Retreat w/Marbella Clad Master Bathroom & King Sized Master Closet. Lovely Landscapes w/Artificial Turf, liberal use of Pavers, Built-in BBQ, and a Sparkling Play Pool! 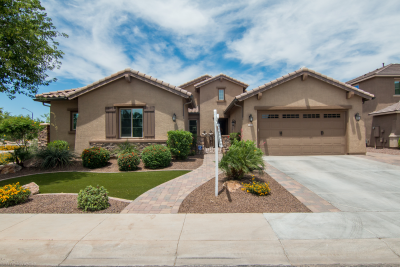 Unbeatable Location near new Super Regional Park, and San Tan Village Amenities!! !